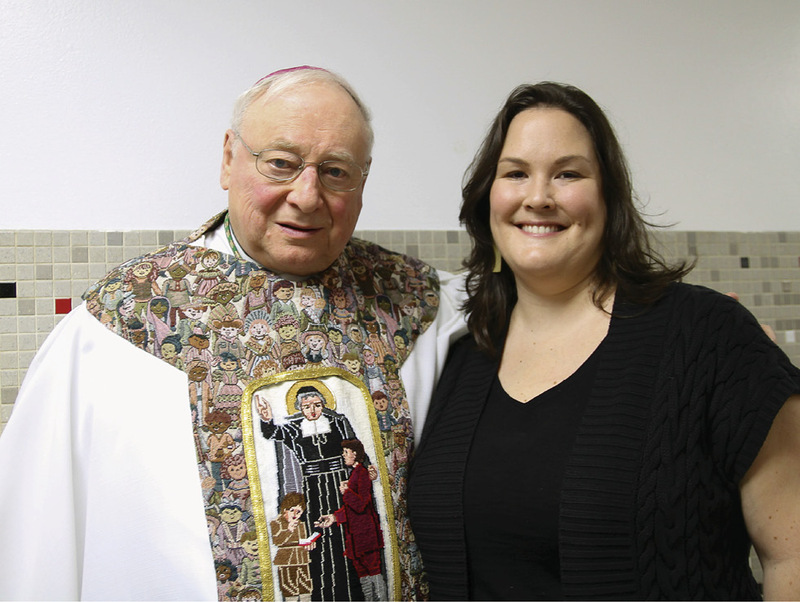 Kate Mahoney stands with Auxiliary Bishop Emeritus Thomas Costello. I am not my story and my story is not who I am. The story of Saint Marianne Cope, Kate Mahoney said, is not only the saint’s story or the story of those who worked toward her sainthood. It is not just the story of those who happened to survive due to St. Marianne’s miraculous intercession. This story belongs to all of us. And that is precisely the story Kate Mahoney wants to share. It appears that included an average 20th Century teenager. In 1992, Mahoney was visiting relatives in Central New York with her parents. The family was between homes in Ireland and Virginia, but Mahoney’s diagnosis of malignant germ cell ovarian cancer transformed the visit into a permanent move. Deciding to stay in the Syracuse area to continue with their daughter’s existing medical team, her parents quickly enrolled her in Bishop Ludden Junior/Senior High School between chemotherapy treatments. Mahoney had a stage four tumor. It was the size of a basketball and was pressing against her spine. She was one of only 1,000 other individuals with the disease at the time — and few were young people. She has no memory of the timeframe between November 1992 and February 1993. During that time, and due to the rigorous cancer treatment, Mahoney said that her “body had been ravaged by the cure.” She experienced multi-system organ failure and while in the intensive care unit at Crouse Hospital she reached a place where, for the average patient, there is no going back. By all accounts, death was inevitable. A visit from Sister Mary Laurence Hanley on January 3, 1993, changed the course of Mahoney’s story forever. The Franciscan sister began praying to St. Marianne for intercession on behalf of the 14-year-old and placed a relic that belonged to St. Marianne near Mahoney’s organs. Prayers spread to Syracuse’s Franciscan residence, St. Marianne’s Utica hometown and the Bishop Ludden student body. Before long, Mahoney’s name was listed on a prayer chain that spanned countries and denominations. She says that after 47 days intubated in the ICU, she was released from the grasps of hallucinogenic and paralytic drugs to find that she couldn’t walk, lift her arms or produce sound with her voice. The long road to recovery had begun. While that personal conversation continues, Mahoney has made it her ministry by telling her own story to encourage others to enlist in this kind of interaction. “The dialogue itself helps shape our world and relationships,” she said. Mahoney admits that learning some decorum helped her find the right things to say. For a time, while St. Marianne’s beatification was pending, Mahoney used to say, “I don’t need anyone to tell me I was part of a miracle.” That nonchalance did not always go over well with traditionalists, she noted. Instead, she followed the lead of St. Marianne and learned better ways to share her message. “Mother Marianne knew when to step in and when to step back. But, she was always moving forward,” Mahoney said. Mahoney’s experience as a teenager colors her relationship with St. Marianne and the young people she hopes to reach out to in her own ministry.